Pittsburgh Penguins coach Dan Bylsma gives instructions to Matt Niskanen and Sidney Crosby during a time out. Pittsburgh Penguins coach Dan Bylsma gives instructions to Matt Niskanen, and Sidney Crosby during a time out. Edmonton Oilers coach Ralph Krueger was on vacation in Switzerland last June when Skype popped up with a contact request. It was from Craig MacTavish, who had become general manager of the Oilers eight weeks earlier. Krueger accepted the request, and then MacTavish told Krueger that he was fired. “I definitely didn’t see it coming,” Krueger told the Edmonton Sun. Statistically speaking, maybe he should have. The Oilers had just finished another season without making the playoffs and Krueger was originally hired by a GM who was no longer with the team. Coaches in similar situations have been fired over the offseason at a rate of 41 percent over the past 20 years. NHL head coaches have one of the highest turnover rates in major sports; their average tenure is currently 2.4 years. That’s slightly more than the 2.3 year average in the NBA, where there was a record number of coaching changes last offseason, but far short of the NFL’s 3.6 years and MLB’s 3.8. Since the end of this NHL regular season, five head coaches have been fired by their clubs, including John Tortorella of the Vancouver Canucks, Barry Trotz of the Nashville Predators, Adam Oates of the Washington Capitals, Kirk Muller of the Carolina Hurricanes and Peter Horachek of the Florida Panthers. In Calgary, coach Bob Hartley is in limbo after his team flamed out and missed the playoffs. Pittsburgh Penguins coach Dan Bylsma’s future rests with a decision from a yet-to-be-hired GM. Hartley and Bylsma wouldn’t be the first coaches to go because of unmet expectations or a new GM. But the data shows firing a coach doesn’t, on average, help a team improve immediately. To see whether there were certain factors that could predict a coach’s dismissal, I compiled a list of more than 240 NHL coaching changes,1 combining it with regular-season and playoff team performance,2 payroll data from The Hockey News and Capgeek.com, general manager changes, and coach demographic data from Hockey-Reference.com. One of the most apparent trends: If a coach’s players don’t perform commensurate to their pay, he’s more likely to get axed. If a team performs below .500 but has an above-average payroll, a coach is 20 percent more likely to get fired than if his team’s payroll is below average and it finished below .500.3 For example, the 2001-02 New York Rangers had a payroll that was 47 percent above the league average but earned a mediocre 0.92 points per game in the standings. Coach Ron Low was promptly fired that offseason. Getting players to earn their pay may not be enough if there’s a new GM in town. When a club hires a new GM, the odds are against the current coach unless he delivers a winning season. The gap is most noticeable for teams slightly below average. MacTavish was himself fired as coach of the Oilers in 2009 after a new GM took office. 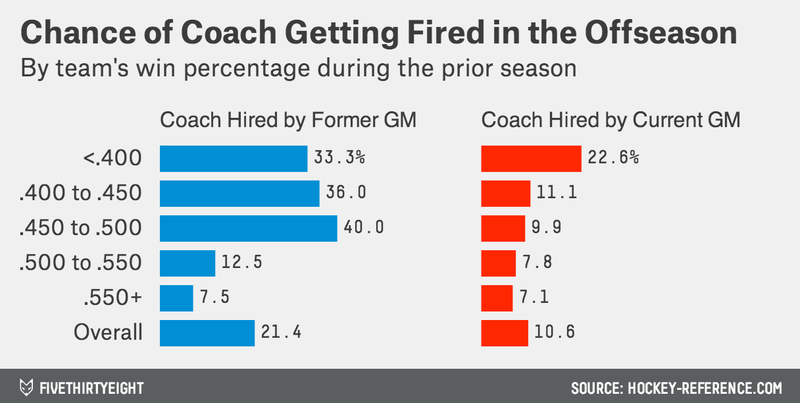 GMs who hired the current coach stay with them at more than twice the rate that new GMs do. Of course, bringing in a new GM can be a leading indicator that club executives have lost faith in the coach, too. While GMs don’t like to stick with their predecessor’s coach, they do like giving new coaches a honeymoon period, with firings peaking in a coach’s third and fourth years. Coaches are unlikely to be fired early in their tenures, and if a coach makes it to year five (something that would mark him as a Scotty Bowman-esque legend), the risk of getting fired is reduced. Even if a coach doesn’t bring his team anywhere close to the Stanley Cup, there’s still an award for improvement: not getting fired. For teams that finish below .500, improving by 10 percent over the previous season reduces the odds of a coach being fired by 35 percent. To determine if firing the head coach makes any difference, I compared teams’ year-over-year performance to whether or not they fired their coach during the offseason. Teams that fired their coaches performed exactly the same on average in the following season as teams that kept their coaches. Notably, teams that were sub-.400 performed 20 percent better on average the following season regardless of whether they fired their coach or not. Often all a team needs is a little regression to the mean, not a shakeup. Playoff performance is no better under new coaches. 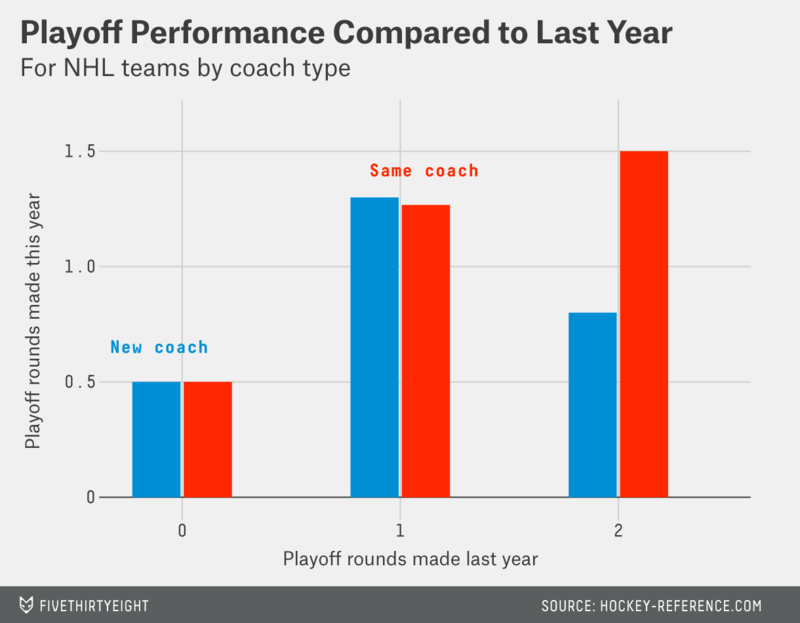 Non-playoff teams go an average of 0.5 playoff rounds the following season, whether they fire their coach or not. With no evidence that the NHL’s rapid coaching churn is driving results, new NHL general managers may want to give it a second thought before hustling their coaches out the door. Coaches who resigned, left for medical reasons, or switched jobs to become GM and interim coaches who didn’t stay on past their interim season were excluded from the data in their final season. To compare across seasons fairly, seasons with standings points for overtime losses and/or shoot-outs had those points scaled down to maintain an average .500 winning percentage. While this metric may have less meaning going forward — when teams are forced to spend within a narrow range due to the collective bargaining agreement — so far it’s been a strong predictor of a coach’s fate.